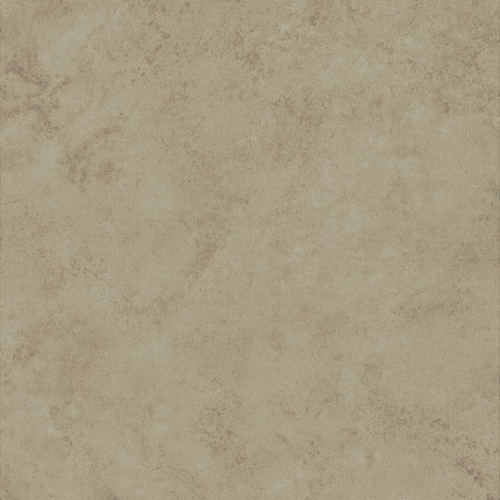 Your LVT floor is really simple to install! Your LVT floor should only ever be used for interior installations and should never be exposed to the weather. You should also bear in mind that direct exposure to excessive sunlight may cause fading so we do not recommend its use in sun-rooms or conservatories where there is constant exposure to the sun. It should also not be used in saunas. 1. Take up your old carpet or carpet tiles. Do not lay your new floor on a carpet or any other kind of soft floor covering. If your existing floor covering is linoleum, pvc tiles, ceramic tiles or any other kind of hard floor covering, then you can lay your new floor on top providing the surface of your existing floor covering is not damaged in any way. Your existing floor covering should also have a density greater than 500kg/m³ which is similar to plywood, and should be fastened by nails or glue to its substrate. 6. Bring your new floor into the room where you're going to install it and let it acclimatise for at least 48 hours. For best results, remove the flooring from the packs and separate into small piles. The ideal environment for acclimatising and laying a floor is a temperature between 18 and 22°C and a relative humidity of 45 - 60%. (2) With hot water pipe under-floor heating systems, the sub-floor slab should be activated to a normal living temperature of 20°C for a minimum of 7 days. The heating level should never exceed 27°C after your floor is installed and when changing the temperature, you should ensure a maximum increase or decrease of 2°C at any one time. You won't need any specialist tools to install your floor. A craft knife, a fine-toothed handsaw (or a jigsaw with a downward-cutting blade), a set square, some 10mm plastic packers, a tape measure and pencil is just about all you will need. You should not use an underlay with your new floor. If you are at all concerned about the moisture content of a concrete sub-floor, use a 0.2mm polyethylene vapour barrier but do not use any other kind of underlay. Vinyl will move depending on the ambient temperature of a room so you must allow for any expansion and contraction to take place otherwise you will find the floor lifting up in the most unlikely places. 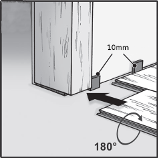 You make this allowance by leaving a 10mm gap around the edge of the floor using the 10mm plastic packers. Don't forget to allow 10mm around every edge of the floor - for instance, around radiator pipes and at doorways amongst others. Don't worry about this 10mm gap being visible when you've laid the floor - we'll deal with finishing off the floor later. A guide for this allowance for expansion and contraction is 1mm per metre of flooring on each edge of the floor so be careful if your floor is greater than 10 metres in any one direction. Watch out also if you're running a floor through a doorway into another room without a break and the combined length of flooring in the two rooms exceeds 10 metres. 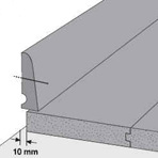 In these situations you can either increase the 10mm allowance - for example, if your expanse of floor is 14 metres long, allow for a 14mm gap on both sides of the room - or put in an expansion profile somewhere, for instance across a doorway as shown in the diagram below.Don't forget to allow the 10mm gap either side of the expansion profile as well. Please note that you should never screw your LVT floor to the sub-floor. Heavy items of furniture on top of your floor may also restrict the movement of your floor so in situations such as this, we recommend gluing your LVT floor to the sub-floor using a non-releasing glue specifically produced for vinyl floors. 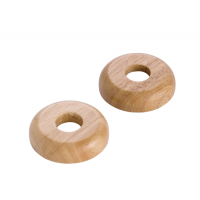 The Valinge 5G WPC interlocking joint used in our LVT floors is really simple to use. 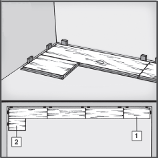 Have a look at the two videos below and see how easy it is to put a floor together. 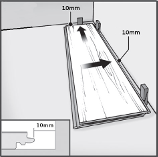 It's worth mentioning here that if you need to take up some flooring which has already been laid, lift up and disengage the row and then slide the boards apart as shown in the diagrams below. 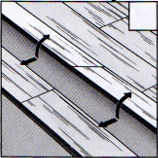 Do NOT lift up the boards to separate them - you will damage the end joint. Place the board tight up against the right-hand wall and insert a 10mm plastic packer so you get the correct expansion/contraction gap. 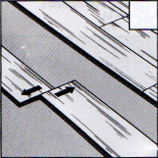 Using a set square, draw a line across the board in line with the leading edge of the previous board (as shown in the diagram above), cut the board to size and put it in place. 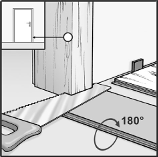 Before you start laying the floor, or at the very latest before you get too close to a doorway, get an offcut of the floor, put it up against the door jamb and then use a handsaw to undercut any architraves and door linings as shown in the diagram below. Clear out any debris so the floor can move freely under the door frame once it's installed. 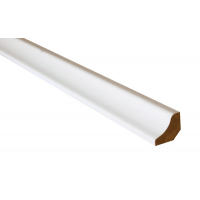 You should end up with a gap at the bottom of the door jamb which allows the floor to move freely underneath AND which at the same time gives you the 10mm expansion and contraction gap, now hidden underneath the door lining. Cut the boards to shape when you reach the doorway, not forgetting the 10mm expansion/contraction gap, so they fit under the door jamb. 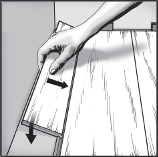 You may find it difficult to click the boards in place around a doorway so chisel off the leading edge of the groove and use an adhesive to glue the boards together wherever necessary. Tap the boards tight up to one another to ensure a good joint. 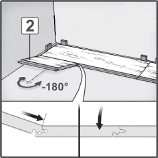 Use a threshold section wherever the floor butts up to a different floor covering and don't forget to allow for the 10mm expansion/contraction gap. Your LVT floor is really easy to look after! Although your LVT floor is one of the easiest floors to maintain, please follow our recommendations below and that way you'll keep it looking fresh as well as protecting the factory finish. After installing your floor, give it an initial cleaning to get rid of any dirt or debris. Your floor's biggest enemy is grit and the smaller the grit, the worse it is. The first thing you must do therefore is to put an entrance mat inside every external door to encourage people to wipe their feet, and hopefully that will prevent any problems from arising. If possible, have one outside as well and also, don't forget to clean your mats every so often. Avoid the use of interior rubber, foam or plastic-backed mats as they may discolour the floor. Clean your floor regularly. Use a brush or vacuum cleaner first of all to get all the loose dirt off the floor and then use a mop to clean it. Use warm clean water, rinsing regularly and then allow it to dry. You can use a quality resilient vinyl floor cleaner to clean up dirt and footprints but be careful not to use too much water. Relocate rugs from time to time to avoid an uneven appearance. Never use wax, polish, vinegar, abrasive cleaners or scouring agents as they may damage the finish of your floor. Avoid exposure to direct sunlight for prolonged periods of time and during peak sunlight hours, use drapes or blinds to minimise direct sunlight. If your floor has been subjected to an excessive amount of water due to flooding, don't panic. Your floor is highly-resistant to water so it won't be damaged. Mop up the water as soon as possible and if necessary use a dehumidifier to dry out the room. If the water has got through to your sub-floor, take up the floor, dry and clean everything, and then re-install your floor. N.B. 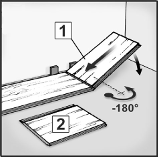 If you need to take up some flooring that has already been laid, lift up and disengage the row, and then slide the boards apart as shown in the diagrams below. 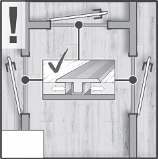 Do NOT lift up the boards to separate them - you will damage the end joint and you may then not be able to reuse the board. All LVT floors are guaranteed from the date of delivery for the period and under the conditions warranted by ourselves. If any goods are found to be defective during the guarantee period and providing such defects have not occurred through incorrect installation, usage or maintenance procedures, or through the liability of other products or persons, we will at our discretion either rectify or replace the defective part of the goods or refund a corresponding proportion of the original price in accordance with the manufacturer's warranty. All goods should be carefully checked for any visible defects both before and during installation. Any goods which are installed in spite of such defects are not covered by the guarantee. Under no circumstances shall we be liable for any consequential loss whatsoever in the event of any claim arising under a guarantee. 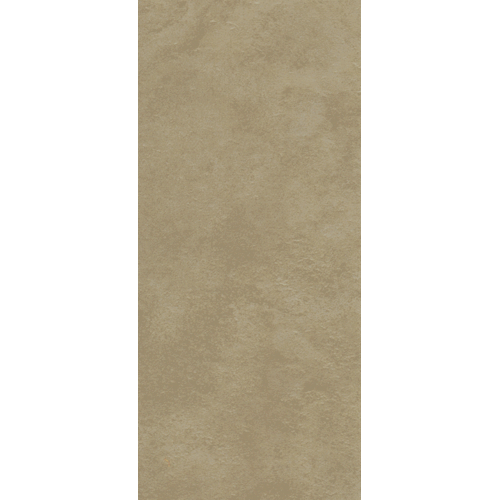 LVT floors are guaranteed for the period set out in the specification tab for each individual floor. They are guaranteed for all residential and commercial installations to be free from defects caused as a direct result of faulty manufacture providing the floor is installed in accordance with the manufacturer's installation instructions, a copy of which can be found in each pack of flooring. LVT floors are carefully inspected by quality control personnel before leaving the factory. However, flooring should be carefully examined by the customer and the installer for any defects prior to installation. In the unlikely event of a defective board being found, it will be replaced free of charge. In the event that a defective board is installed whether inadvertently or deliberately, no warranty shall apply. All LVT flooring is manufactured using a sophisticated bonding system with each board being produced under intense heat and pressure to ensure the highest level of quality. In the unlikely event of any structural failure of a board within one year of the installation of the floor, we will at our discretion either repair or replace the defective board free of charge. If failure occurs more than one year after installation but before the end of the warranty period, the liability under this warranty will decrease by 10% of the invoice value each year and will be limited to the repair replacement or refund (at our discretion) to the decreased value for that year. Improper installation - Performance of the floor is highly dependent upon proper installation. 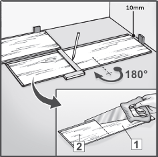 Installation must therefore be in strict accordance with the LVT installation instructions. Improper maintenance - Maintenance must be in strict accordance with LVT maintenance instructions. Abnormal environmental conditions - LVT flooring products are guaranteed to perform in what we consider to be normal residential and commercial applications. Any exposure to excessive heat or excessive moisture may cause damage to the flooring and is not covered by this warranty regardless of cause or source. Electric under-floor heating systems are able to supply an almost instantaneous heat to the floor which warms up the floor over a very short space of time. This can cause tensions within the floor. We cannot therefore guarantee an LVT floor which is laid over electric under-floor heating. Any damage caused by environmental conditions outside the tolerances specified in the LVT installation instructions is excluded from any or all of this warranty. Misuse - No responsibility will be accepted for any damage caused directly or indirectly through misuse, abuse, accident or use that is not consistent with the LVT installation instructions. No guarantee either express or implied is given for any damage due to inadequate care or other causes including without limitation, stains, damage caused by worn or narrow-heeled shoes, by the movement of furniture or equipment, by heavy items, by impact, by scratches or scarring caused by pets or other animals, by abrasive or sharp-pointed items, or by extreme heat..
Alterations or repairs - Alterations and unauthorised repairs to any LVT flooring will void any and all express or implied warranties including merchantability or fitness for purpose. Any authorised repairs will not extend the guarantee period. Reinstallation - In the event that we replace defective boards, we shall not be liable to provide for or incur the costs of removing or reinstalling the defective floor or resurfacing or refinishing the replaced or surrounding floor or to provide for the cost thereof unless and to the extent expressly provided in the warranty description above. No liability to replace or repair shall extend to any other materials or any other items used in the course of removal, installation or refinishing. The above warranty is the only warranty either express or implied provided by ourselves for residential and commercial applications. Except as stated herein no other warranty, express or implied, is provided including any warranty of fitness for a particular purpose. No retailer, installer, dealer, distributor, agent or employee has authority to increase the scope or alter the terms or the coverage of this warranty. No agreement to repair or replace shall in any event act to extend the period of coverage of any warranty provided. In no event shall we be liable for any claim loss or damage arising from the purchase, use or the inability to use its products or from any form of special, indirect, incidental, or consequential damages including, without limitation, lost profits, emotional, multiple, punitive or exemplary damages, or legal fees. In no event shall we be liable for the costs of old or new materials other than LVT floors. In no event shall our liability exceed the amount we actually received for the sale of the defective materials concerned. Any claim under the terms of this warranty must be made within seven days of the date on which the defects first became known or first should have been discovered. All claims must be in writing and in order to make a claim under this warranty, evidence of the purchase date and the identity of the original purchaser and installation location must be provided. Without such proof, no warranty shall apply. 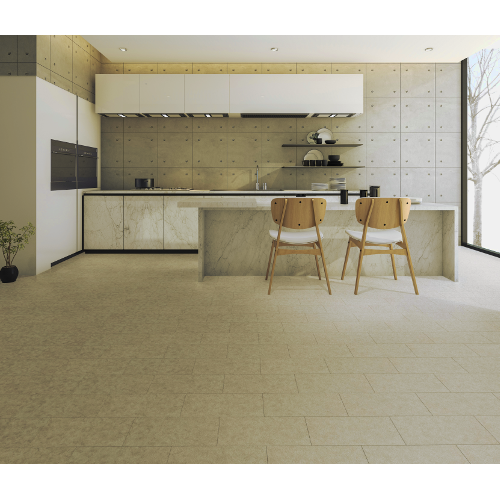 A modern light concrete tile vinyl floor bringing a touch of class and practicality to just about any room throughout the home and indeed to commercial interiors. Even chisels can't tell the difference! The technology of vinyl boards means that any look is possible, enabling you to create a stunning interior suitable for just about anything. The textured finish on this light concrete tile vinyl floor adds a textural dimension to give even more character, which coupled with the practical benefits of easy installation, moisture-resistance and easy maintenance, makes this a superbly cost-effective floor. Cleverly engineered to provide strength and stability and laid as a floating floor with no need for any bonding to your sub-floor, its profiled edges enable anyone to lay this floor absolutely perfectly every single time, just like a professional would! PRICE PER PACK IS JUST £54.69 INCLUDING VAT! A white scotia beading for the perfect finish around your floor, ideal for vinyl floors! Simple.. Solid oak radiator pipe covers, available either pre-finished or unfinished. 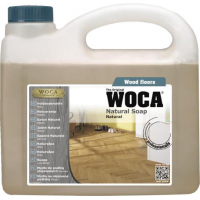 Yet another produc..
A natural soap cleaner - just the thing to keep your floor looking as good as new!WOCA Natural Soap ..